The reflective white surfaces of the acrylic cabinets and quartz counters give the kitchen a fresh, contemporary look. The pendant lights, desk lamp and knobs on the cooktop add a touch of red to play off the blue. The design embraces symmetry, which can be seen on either side of the window and island. 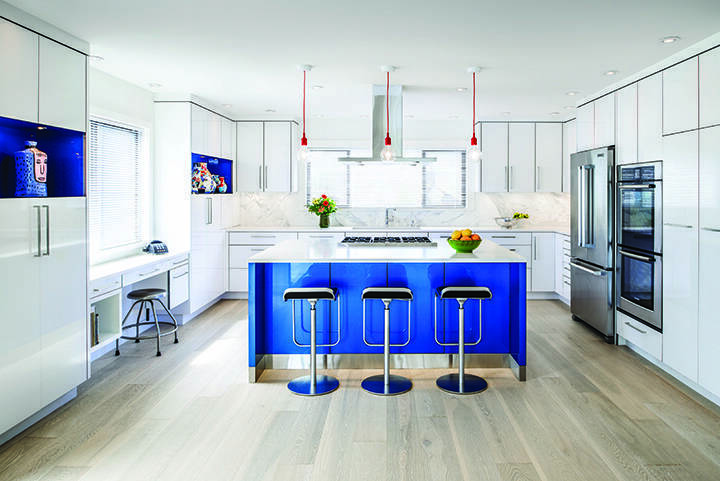 There’s no doubt that a judiciously chosen accent colour can really make a statement, as evidenced by the modern kitchen in this renovated home on Gonzales Beach. It’s even more satisfying when there’s a story behind the choice. In this case, blue is one of the homeowner’s favourite colours and she really wanted a particular shade she had seen on a Toyota car. 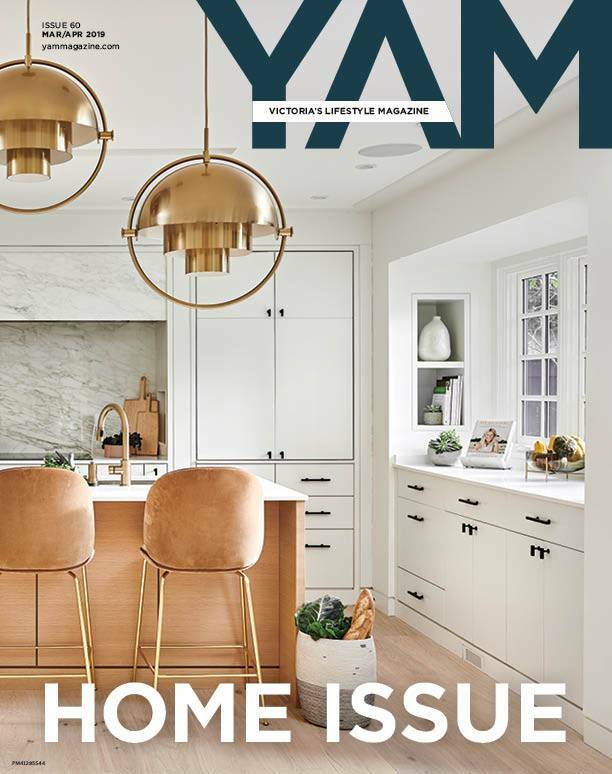 When she tracked down the automotive colour formula, Jason Good of Jason Good Custom Cabinets used it on the kitchen island and cabinets inserts, creating a striking focal point in the room and adding an unexpected dose of drama. “It actually has an incandescent finish, so it looks like a car,” says Claire Reimann, associate kitchen and bath designer at Jason Good Custom Cabinets. 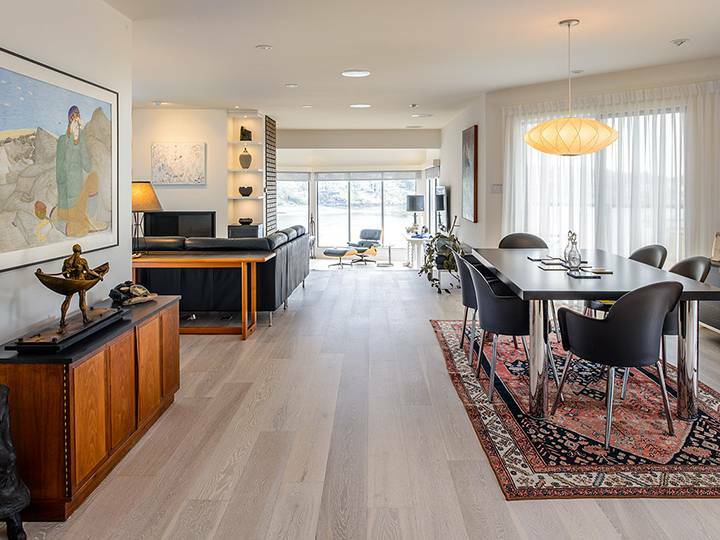 While the homeowners were primarily looking to upgrade their kitchen, they also wanted to remove the internal walls on the main floor, to open the space up and better exhibit their art — and the gorgeous view of Gonzales Beach. Working with Tony Aindow of Goodison Construction, and Jason Good and Claire Reimann, the homeowners embarked on a seven-month refurbishment of their main and upper floors, creating a contemporary home that feels refined and refreshingly down to earth. And one of the best parts, according to Aindow? 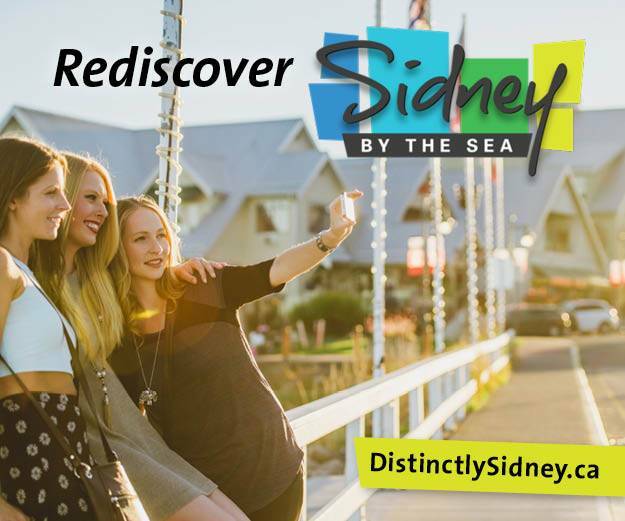 “Standing in the kitchen admiring a beautiful space with Gonzales Beach as a backdrop — it’s stunning,” he says. The entryway tile, Rox by Campogalliano in Dust, leads to the stairwell, done in Kentwood’s Snohomish White Oak and finished with stainless steel nosings. 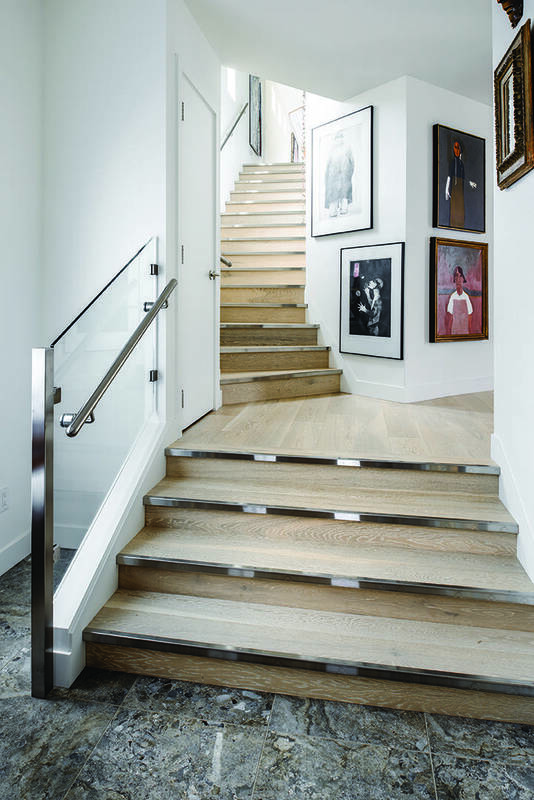 The clean lines of the stairwell act as the perfect backdrop for the eclectic mix of art on display. 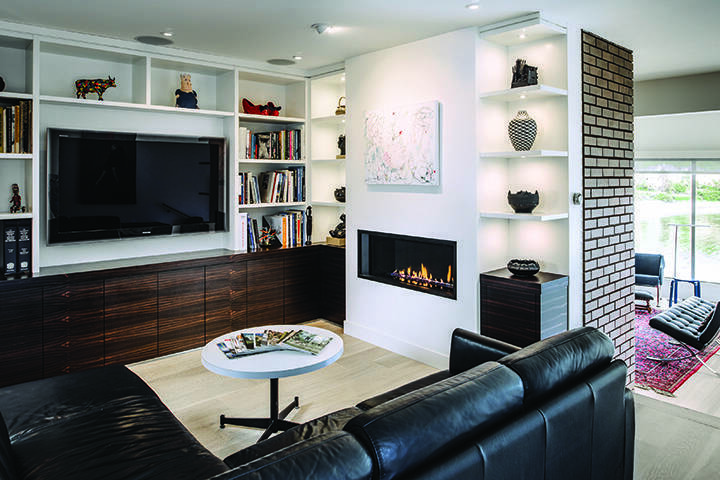 Symmetry is also an important design element in the built-ins in the living room. The shelves around the fireplace light up to illuminate the curated array of art and objects. A painting by Victoria artist Margo Cooper hangs over the fireplace. The brick wall is one of the features retained from the original layout of the house. Snohomish White Oak flooring is found throughout the home’s main floor, giving it a warm, appealing feel. 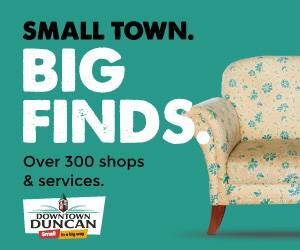 Notable artwork includes the painting over the credenza by Shuvinai Ashoona of Cape Dorset, and the sculpture of a standing man in a boat by Ted Gall of California. Distinctive artwork can also be found in the bathrooms, such as this print by Luke Anguhadluq of Baker Lake. 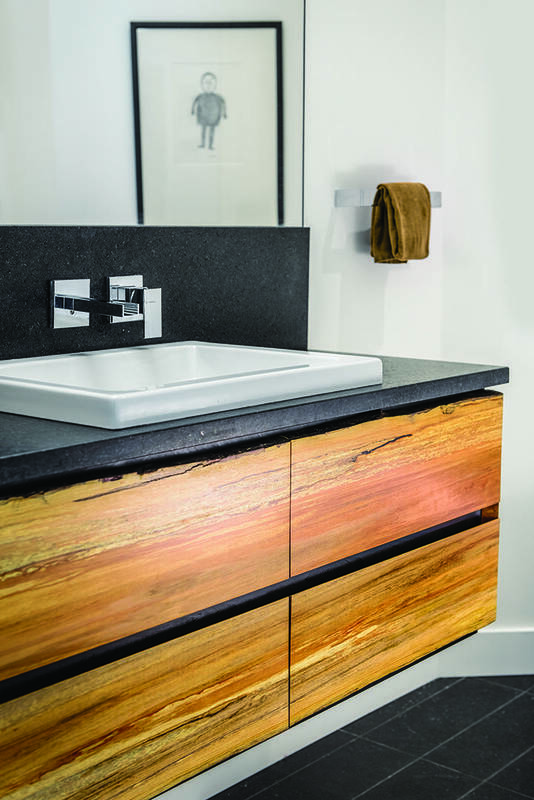 The vanity features spalted maple with a live edge and a quartz counter. 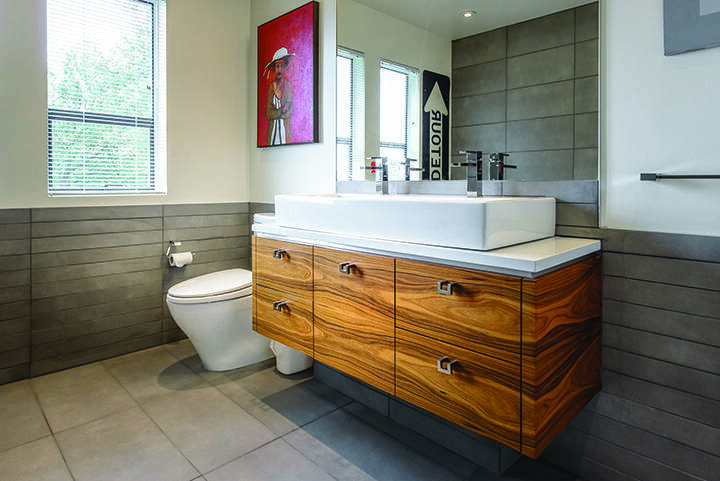 A rosewood vanity adds an element of warmth to the large powder room, providing a nice juxtaposition to the cool tones of the Caesarstone Blizzard quartz countertop and the porcelain tiles. Built-in book shelves in the master bedroom create an inviting and comfortable ambience. The shelves are home to an eclectic yet skillfully organized arrangement of books and art pieces. General contractor: Goodison Construction Ltd.